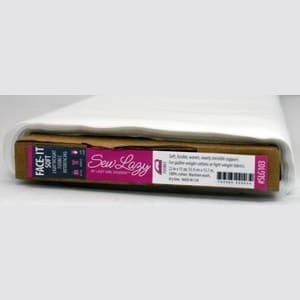 Use Face-It Soft on fabric for nearly invisible support and to add body. Ideal for purse pockets, apparel collars/cuffs, knits, craft projects, and more. Lightweight woven 100% cotton fusible interfacing. Note: Pre-shrink Face-It Soft by submerging it in warm water for 15 minutes, allow to air dry before use. – Press for 10-15 seconds with Face-It Soft on top of fabric. adhesive from getting on iron or pressing surface.